The Irish, "Inis Eoghain", translates to "The Isle of Eoghain". It's not an island, as you can see. I have a theory on that, but this is The Gallery and that's for the "Ireland for Dummies" page. Inishowen's northernmost point, Malin Head, is as far north as you can go in Ireland. Next stop, North Pole. 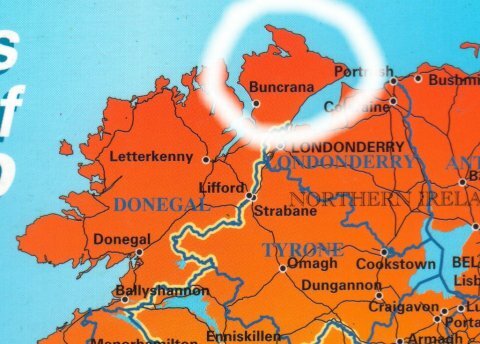 In fact, we're north of all of Northern Ireland, which leads to interesting cartological conversational gaffes like my, "Let's go down to The North". Here, they say, "Let's go up to Derry", even though it's south of us, and they're right - it's upriver! You'll note, below, that (London)Derry is south of us. Click the pic to continue.